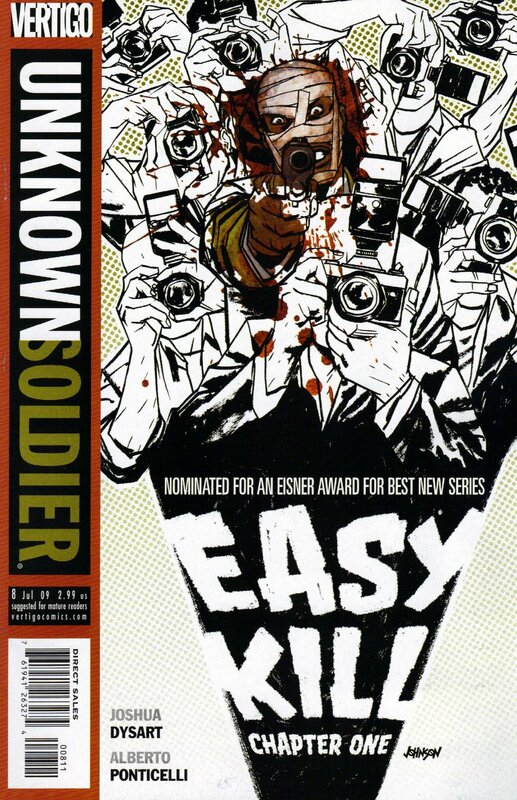 Another dark and furious issue, kicking off the new ‘Easy Kill’ arc. As audacious a storyline that you are ever likely to find in a comic book, here Moses Lwanga (aka The Unknown Soldier) is propositioned by a new activist group to carry out the brutal killing of an American Actress whose charitable works in Africa are noted. A veiled reference to Jolie or Madonna? Her death could be attributed to the LRA (Lords Resistance Army, comprised of press-ganged Child Soldiers), and their leader become a pariah, hunted and eventually destroyed. The argument, to persuade Moses to carry out the deed, is that the sacrifice of one individual could dramatically relieve the suffering of the many – that cold blooded murder can be justified when extreme times call for an extreme response. It is a fascinating argument, one that no doubt will be examined fully in the issues to come. That is not all – in this issue we get to see the terror and misery of those most likely to be exploited and abused in this conflict – the children. Dysart and Ponticelli pull no punches, and Moses’ attack on the LRA early on in the issue is astounding in its determination to show a truth that the Western / First world have no comprehension of. Some of it is hard to read at times – its a brutal, bloody read, political, angry and focussed. This arc is threatening to be a classic. I believe the title itself already is a classic.